I used to have dell precision t3500 many times before. 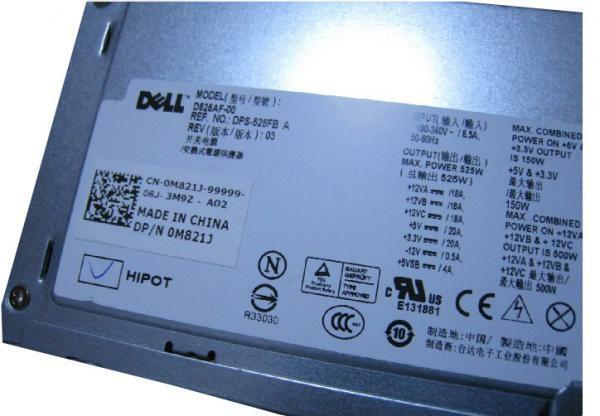 The oem of those 525w power supplies are made by delta so the quality overall in them are old but decent enough to handle a video card with no issues. The limiting factor of this power supply is that it only has a 6pin power connector and the majority of rx 570 have 8 pin power connectors. I needed to get a 6pin to 8pin to make one of my rx 470 to work with my system. It has been running very well with an slighter higher power limit set on my video card and the adapter wasn't hot to the touch. Those dell workstation have a bunch of untapped power that many budget users could get a great benefit out of it. That PSU in this system was not designed to handle the power requirements for a GPU with an 8 pin PCIe power cable. The PCie 6 pin power cable only provides up to 75 watts of power. Even if you use the 6-pin to 8-pin adapter, it should only provide up to 75 watts, where an true 8 pin PCIe power cable that comes straight from the PSU would provide up to 150 watts. If the card attempts to draw more than 150 watts (75 from the boards PCIe slot and 75 Watt from the PSU) you may face a catastrophic scenario where you can break the GPU, PSU or other components as well. And we don't even know if the PCIe slot from this board can give up to 75 Watts for the GPU. I would not recommend using any adapters to try and make it work! The OP should just get a new PSU with an appropriate 8 pin PCIe power connector. "Even though the specification allows for a delivery capability of 75 W (six-pin connector) or 150 W (eight-pin connector), the total power-handling capacity of these connectors is at least 192 and 288 W, respectively, using standard terminals, and even more using the HCS or Plus HCS terminals." Tdlr: It handles much, much more than what the specs leads to believe. Also the combined 12v rails on the psu can handle up to 500w at the same time. You're also ignoring the fact that my exact system has been working for 3 months with the msi rx 470 with a rised power limit and yes the board itself provides up to 75w. depends on the quality of that "525 watt" PSU. a lot of the older prebuilts that have those power supplies often cannot supply what they are rated at due to the low quality of the internals. it will depend entirely on what you have. if it can supply what it is rated at, then you should be able to run a 570 if it also has the correct VGA power connectors.